It wasn't enough for me to take Steve's idea to do a month of horror, I also had to lift one of the movies that he chose for his lineup. 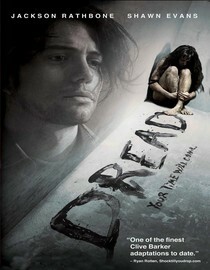 Tonight I watched Dread, which he also watched and blogged about. The movie's based on a story by Clive Barker, so it's automatically got at least a little bit of horror cred. The story centers around three college film students who decide to do their thesis project about fear, interviewing other students about their innermost terrors. Through the course of the movie, we also learn about what has left marks on the filmmakers' psyches, and the extent to which it has damaged them. At the conclusion of their project, one of them decides that he hasn't yet seen the results he wants, and that the project needs to be taken to another, much more extreme level. The first two-thirds of the movie are pretty heavy on exposition, and don't move too quickly, but when the final third comes, the setup pays off. For the first time this month, I truly did not see the ending coming before it happened. I thought I knew where it was leading, so it was a nice feeling to get outsmarted by one of these movies for a change. My one complaint is with the character Quaid, who decides to push the project further. His motivation for this becomes clearer as the movie progresses, but the way he interacts with the other characters rings false. You know in some movies (not just horror, any genre) how there's that one character who thinks that the other characters aren't living life to the fullest/giving their all to a project/truly getting the lessons out of life that they should/etc. The character who deeply, earnestly, annoyingly believes in something and just can't rest until they have shown the world how deeply, earnestly, and annoyingly they believe in it? The character who says stupid crap like, "Open your eyes! Embrace the fear/love/lesson/whatever!" Like Natalie Portman in Garden State, except that she falls more into the Manic Pixie Dream Girl category. Anyway, that's this guy in Dread, except that he's pushing them towards their fears instead of their quirks. That aside, though, this movie was pretty solid, and caught me off guard. Although it's in The Evil Men Do category, it's escapist enough that I still enjoyed watching it. I give it four fireman's axes out of five. I learned something thanks to Project Horror! Thanks Project Horror Master! Manic pixie dream girls, score one for proper taxonomy. I was primed to confute any reduction of the Portman character in Garden State, as I love her so. But Nathan Rabin's got her, and her tribe, dead to rights. Great reference. Don't get me wrong - I like Natalie Portman a lot, and even think that Garden State is a pretty good movie, but I'm not a big fan of the MPDG stock character. Glad to add one to your vocab! Glad I could further inspire you with this one! I think the is the best of the films we've seen so far (that we hadn't seen before). It's certainly the one that's stuck with me the most. Watching this many in a row has made me especially resentful of bad endings, especially bad twist endings, but the final sting on this one got it just right.